Send2Press › Wire › Business › Reports and Studies › Web 2.0 Apps to Generate $455 Billion for Mobile Carriers, Fixed Line Operators, and Third Parties Over Five Years, Says Insight Research Corp. Web 2.0 Apps to Generate $455 Billion for Mobile Carriers, Fixed Line Operators, and Third Parties Over Five Years, Says Insight Research Corp.
MOUNTAIN LAKES, N.J., June 13, 2011 (SEND2PRESS NEWSWIRE) — In 2011, telecommunications carriers and third-party software developers worldwide are expected to generate just over $35 billion in new revenue by helping build and deploy Web 2.0 services, according to a new market research study from The Insight Research Corporation. The term Web 2.0 is shorthand for a rapid deployment service paradigm used to create new applications for downloading to smartphones, applications that that run inside the service provider’s network to provide enhanced services, and applications built outside the service providers’ networks using APIs exposed by the service provider to couple their capabilities to other new applications. According to Insight Research’s market analysis study, “Web 2.0, Mobility and Fixed Line Applications: The Revolution in New Applications Development, 2011-2016,” REST, AJAX, and widgets are the important technologies underpinning the new applications development environment; however, the most important aspect of Web 2.0 is its business approach. Those deploying Web 2.0 services assume that their applications are built to be combined, with exposed interfaces that facilitate this, and a strategy of encouraging third party developers to combine these pieces into new applications that will benefit the end user. “After more than 20 years of false starts with the IN, Parlay, and IMS architectures, along comes Web 2.0 and carriers finally have an architecture-independent software that developers are embracing. This architecture quickens the pace of new applications deployment and thereby boosts network usage, so we think carriers will soon be lining up to support Web 2.0,” says Robert Rosenberg, Insight Research. “With a projected compounded annual growth rate of 30 percent and with new revenue opportunities for mobile operators, fixed line operators, VoIP providers and the apps developers themselves, we see opportunities for all to get a slice of the pie,” Rosenberg concluded. An excerpt of the “Web 2.0, Mobility and Fixed Line Applications: The Revolution in New Applications Development, 2011-2016” market research report, table of contents, and ordering information are online at http://www.insight-corp.com/reports/web2011.asp . This 139-page report is available immediately for $3,995 (hard copy). Electronic (PDF) reports can be ordered online. Visit our website – http://www.insight-corp.com – or call 973/541-9600 for details. 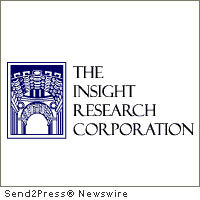 – RSS news feed for Insight Research: https://send2pressnewswire.com/author/insight-research-corporation/feed . Original Keywords: market analysis study, Robert Rosenberg, Web 2.0 Mobility and Fixed Line Applications The Revolution in New Applications Development 2011-2016, REST, AJAX, and widgets, mobile operators, fixed line operators, VoIP providers and the apps developers, Web 2.0 services Insight Research Corporation Mountain Lakes New Jersey MOUNTAIN LAKES, N.J.
REFERENCES: Advertising and Marketing News, market analysis study, Robert Rosenberg, Web 2.0 Mobility and Fixed Line Applications The Revolution in New Applications Development 2011-2016, REST, AJAX, and widgets, mobile operators, fixed line operators, VoIP providers and the apps developers, Web 2.0 services Insight Research Corporation Mountain Lakes New Jersey MOUNTAIN LAKES, N.J.